Your international flight arrives in Beijing today. Our guide will pick you up outside the Arrival Hall of the airport, holding a welcome sign with your name on it. A private transfer will take you to the hotel, which has a pretty good location. You can spend the rest of the day simply relaxing at the hotel or taking a leisurely walk around the street nearby. Your private 10-day China tour itinerary starts in the morning. 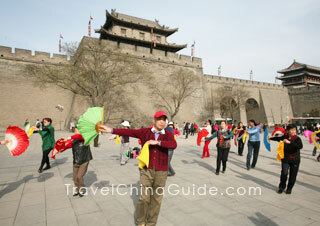 First our guide will accompany you to stroll across the world's grandest city central square, Tiananmen Square. With a history of more than 500 years, the square has witnessed many historical events and significant celebrations, such as the founding of the People's Republic of China and the dignified military parade on National Day. Then you will enter the Forbidden City, the world's largest palace complex, from its south gate. It is said that the palace has 9,999.5 rooms where the emperors and his family had once worked and lived. Lunch is on your own expense, but our guide will give you some good suggestions if you need. You will explore the Summer Palace in the afternoon. Once used as a luxurious royal garden by the Qing royalty, the delicate scenery and ingenious layout inside earned it great fame from both home and aboard. This morning we will take you to one of the world's greatest man-made projects, the Great Wall at Mutianyu section, and the round-way cable car is contained. Initially set up as a fortification more than 2,000 years ago, the Great Wall is an amazing product of diligence and intelligence of ancient Chinese people. Please make your own arrangement for the lunch. As the food offered by many restaurants near the Great Wall cannot come up to the expected standard, we suggest you have a big breakfast in the hotel. You guide is ready to help you find somewhere better to have lunch if you want. On the way back to downtown, we will drive by the Bird's Nest (Olympic National Stadium), where the 29th Beijing Olympic Games were held. You can take some photos of its external features. In the afternoon, you will be escorted to explore the Temple of Heaven. 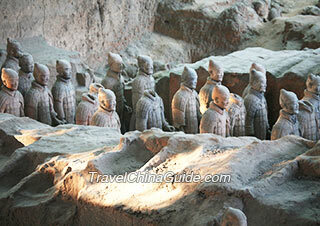 Once a site where the emperors offered sacrifices to the heaven, it is even larger than the Forbidden City. Its main buildings progressing from south to north are the Circular Mound Altar, the Imperial Vault of Heaven and the Hall of Prayer for Good Harvest. 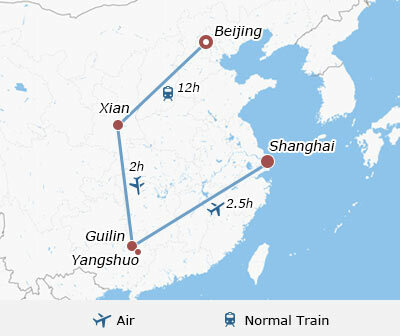 After that, we transfer you back to the hotel and our guide will hand the train tickets of Beijing to Xian over to you. Enjoy your breakfast at the hotel. Please go through the check-out formalities as required by the hotel. For your convenience, we recommend you deposit the luggage at the hotel concierge. If you would like to do a self-service exploration to more places of historical interests, we suggest you start from Jingshan Park. Riding a taxi (CNY10) for 15 minutes, you will arrive at the park. It is another beautiful royal garden with a history of more than 800 years, and today it is the most favorite location for photographers taking panorama of the Forbidden City. Leaving from the West Gate of Jingshan Park and walking for about 500 meters, you will find the Beihai Park. Beautiful islands, white tower, pavilions, green trees, flowers, rocks and the Buddhist buildings make the park like a fairyland. Then exit from the North Gate of Beihai Park and pass through the Dianmen West Street, you will arrive at the famous Hutong Area - Shi Cha Hai, which is called water town in northern China for it is composed of three large lakes, including Xihai, Houhai and Qianhai. Around this area, you will meet large and small intertwining Hutongs, Skewed Tobacco Pouch Street and Silver Ingot Bridge, and truly understand the culture of original Beijing. Also there are lots of restaurants, bars, cafes in the Hutong area for your selection. Afterwards, you may go back to the hotel by taxi at about CNY16. After picking up your luggage, you can take taxi to Beijing West Railway Station. It takes around 25 minutes at about CNY22 if there is no traffic jam. We suggest you set aside enough time for the transfer and arrive at the railway station at least an hour and a half prior to the train departure time. Train in China is different from ones in other countries, and the train travel is a great way to know our country better. Due to the limited choice of food on the train, the fast food or snacks should be prepared for dinner in advance before getting on board. Besides, please aware that the private compartment is not big and the space is limited, so we kindly invite you to read the compulsory train baggage allowance tips beforehand. The train arrives at Xian in the morning. Our guide will pick you up at the platform of the railway station and transfer you to the hotel. We leave breakfast up to you since there are many acceptable restaurants near the hotel. The highlight of today's guided tour is the morning excursion to the world's largest underground martial museum, the Terracotta Warriors and Horses Museum. The significant underground terracotta army in battle formation is actually the accessory pit beside the first emperor's mausoleum to guard his afterlife. The unearthed life-figured terracotta warriors and horses as well as the chariots and weapons exhibit the sovereign power and incomparable wealth of Emperor Qinshihuang 2,200 years ago. We do not arrange lunch, but you can ask for your guide's suggestion. In the afternoon, visit the Shaanxi History Museum, which exhibits numerous cultural relics from one million years ago to the present. Then we will take you to see the Xian Museum and the Small Wild Goose Pagoda. This is a 13-story brick pagoda in a shape of square pyramid, built in Tang Dynasty and used to collect the Buddhist materials brought from India. Here, you will also have an opportunity to appreciate a variety of valuable historical relics at the museum. At the end of sightseeing, we will transfer you back to the hotel. This day is left for you to further explore the ancient city on your own. We first suggest you visit the City Wall, which is the largest and most integrated existing ancient city wall all over the country. Once acted as a huge and precisely designed military defense system, it is now a famous attraction. Get out of your hotel and turn left to walk to the South street, walk down the street, you will find the South Gate of City Wall. Climbing up the wall, you can either walk or ride a bicycle on it. Then walk back to the city center area. The attractive Bell Tower and Drum Tower a few steps away can be your next stops. We also suggest you pay a visit to the Muslim street behind the Drum Tower. Muslim street is a residential zone of Hui people in this city. Strolling around the street, you will not only taste the delicious local flavors, but also get an insight into the religious tradition and living habits of Hui people. In the early afternoon, you may go back to your hotel to pick up your luggage, and then take the shuttle bus to the airport and fly to scenic Guilin. We will book the air ticket and offer the flight details in advance to you. The shuttle bus station is very near your hotel. Walk south to the Bell Tower Crossroad and turn right for about 100 meters along the West Street, you will find the airport shuttle buses in front of the Melody Hotel. 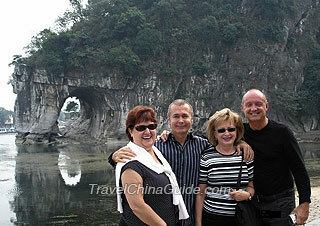 When your flight lands on Guilin airport, our guide will pick you up and transfer you to the hotel. The highlight today is a cruise excursion along the Li River from Guilin to Yangshuo. Our guide and driver will transfer you to the pier to board the cruise ship. 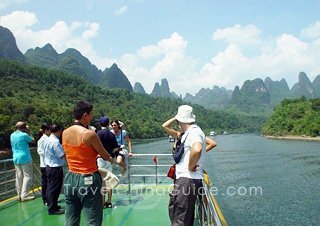 Then the activities along the Li River and in Yangshuo will be handled on your own. There is no lack of astonishing scenic wonders along both banks of this downstream section of Li River. A boat excursion would be a great way to admire the picturesque scenery here. Upon arrival at Yangshuo, it is better to have a stroll along the famous West Street. This is a vibrant place alive with cafes, pubs, restaurants and where many westerners gather. Then, you can take an electric car to travel around the villages of Yangshuo to enjoy the breathtaking countryside scenery. Today's cruise experience along with the countryside trip will be one of the most memorable parts of your journey. Late in the afternoon, please take bus back to Guilin by yourself. 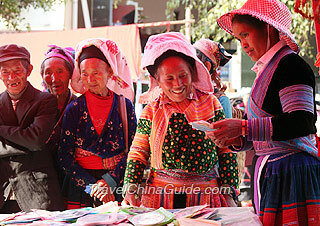 The shuttle bus ticket from Yangshuo to Guilin can be purchased easily at the bus station. Tips: Unfortunately the lunch served on the cruise is simple Chinese box lunch, which is not up to the standard that TravelChinaGuide would like. So we recommend you take a hearty breakfast at the hotel in the morning. You will explore the major attractions in the city by yourself today. We suggest you take taxi to the sightseeing spots as it is the most convenient way. The first spot we suggested is the Reed Flute Cave. Illuminated by colored lighting, the various rock formations like Crystal Palace, Dragon Pagoda, Virgin Forest, Flower and Fruit Mountain make the cave a fairyland. Besides the amazing rock formations inside, the idyllic scene outside is also pleasing. Then, you can dine lunch at one of the restaurants close to the Seven Star Park for lunch. Being renowned for splendid natural landscape and valuable cultural relics, this park covers the Seven-Star Mountains with its beautiful mountain scenery and emerald waters. Afterwards, pay a visit to the land symbol of the city, Elephant Trunk Hill. The hill is called so because it looks like a huge elephant drinking water from the river with its long trunk. After that, you may go back to your hotel to pick up your luggage and then, take a taxi to the airport and fly to Shanghai. It may take about 40 minutes to the airport by taxi and cost around CNY100. We will arrange an afternoon flight for you. In Shanghai, we only book hotel for you. It is a good chance for you to discover this metropolis city by yourself. As you will arrive in Shanghai in the evening, we suggest you take a taxi to the hotel we booked for you. It takes about one and a half hours from Pudong airport to your hotel at cost of CNY170. If you land at Hongqiao airport, it may take around half an hour and cost no more than CNY60. This morning we suggest you take a taxi to Shanghai Museum. After about 20 minutes driving with the taxi fee of around CNY20, you will arrive at this huge museum. Exhibiting both ancient historical relics and modern artworks of the country, it is definitely worthy of your visit. Then you can proceed to the Yu Garden also by taxi. It only takes 10 minutes at around CNY15. Yuyuan Garden is one of the representatives of south region classic gardens. The pavilions, halls, rockeries, ponds and cloisters in the garden all have unique Chinese gardening characteristics. There are many restaurants in its nearby streets, so you can have your lunch there with various choices. 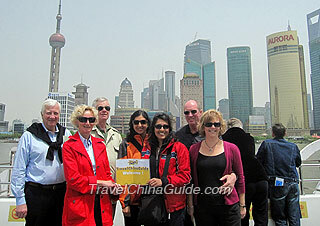 Afterwards, it may be best for you to walk to the Bund area, which is no more than 1000 meters away. If you are interested, you can also take the Huangpu River cruise at the Bund wharf to appreciate the two representative profiles of the city along two sides of the river. It helps you understand the past, see the present and look into the future of this modern city. After that we suggest you have a stroll on the famous Nanjing Road in the neighborhood. Built in the colonial period in the 19th century, Nanjing Road has nowadays become one of the most famous shopping centers in the city as well as a popular destination. The well-known stores from home and abroad make it no less prosperous than any other famous business streets in the world. After the whole day visit, you can take a taxi back to your hotel with the taxi fee of CNY20. Your China itinerary for 10 days comes to an end today. After breakfast, please pack your luggage and check out of the hotel. You may choose to take a taxi to the airport. The journey to the Pudong Airport (PVG) takes about one and a half hours from Golden River-view Hotel. The other economical way to the Pudong Airport is to take the Subway. Please get to the Hanzhong Rd. Station not far from your hotel to take the subway Line 1 to the People's Square (Renmin Guangchang) and transfer to Line 2 to reach Pudong Airport. If your flight leaves from Hongqiao Airport (SHA), it only takes half an hour by taxi. By subway, you can also take the Line 1 and transfer to Line 2 at People's Square stop to Hongqiao Airport. Please notice that the rush hours are from 07:00 to 09:30 and from 16:30 to 19:30. Hope next time we can still serve you with our dedicated 24/7 service. 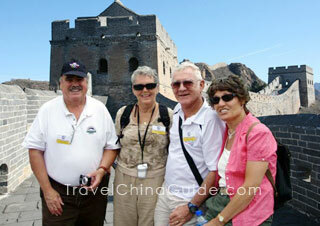 At present, just private tours are non-shopping tours. What are the prices and options to get from PuDong airport to Hotel Equitorial Jingan Temple? Do these transfers or shuttles drop you off outside or the hotel or in a drop off area? You can take shuttle bus line 2 to Chengshi Hangzhanlou (City Terminal) and the walk southwest for 5 minutes to your hotel. The fare is CNY22 and the duration is 1h. Thanks for the answer. Because we have big suitcases do you know how much a taxi would be from the airport to Hotel Equitorial Jinan Temple? The taxi fare us around 170-180yuan. Thank you for your reply and information. Again, this chatting forum has been really informative and well appreciated. Thanks to all who have replied. Transportation to the national exhibition center from PVG. You may take subway line 2 at PVG and get off at Xujing East. Take exit 2 and you can see the National Exhibition Center. Easy to buy train tickets? Large crowds waiting in line? Do they take USA credit card? Yes, generally speaking, there will have enough tickets of Maglev Train. There won't crowded people in usual time. You'd better prepare some cash in advance. I would suggest you take a small amount of cash when traveling. Most of the big restaurants, shopping malls and hotels in China accept the Credit Card. And you can also withdraw money at China's bank or ATM machines. For your reference, it normally costs around CNY100 for meals at an ordinary restaurant per person per day. In regard to the transportation, to save the cost, you are advised to buy a Transportation Smart Card, which can be used on subways, city buses and some taxis in Beijing. The card can be bought at the ticket offices of the subway stations, some bus stations and Post Offices. The price for the subway in Beijing is charged according to the travel distance and the starting price is CNY3 for first 4 miles. By using the card, you can enjoy 20% discount for expense between CNY100 to CNY150, and 50% discount for expense between CNY150 to CNY400.